The Art of mixing is of course about mixing. Mixing is what helps a song to play everywhere. But when you see a mixing board you got to wonder what do I do and where do I start. Even if you go to a studio you want to know what the engineers doing with the song and you might have a few ideas. 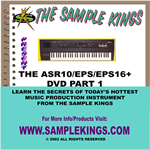 This DVD will show how mixing works we start with just the drums we get the kick, snare, and hi hat and mix levels then I want to compress the kick drum to give it more bump, next I'd like to Eq then compress the snare to give it a little snap . I drop some bass off the snare drum then I might want some reverb on just the snare drum and hi hat. There are even rules on what goes first like Eq then the compressor if I want to compress the frequency you eq for. Lets say we have some headphone noise on the vocal track I just add a gate to block it out when the vocalist is quiet and just in the booth listening to the song before his next part comes in that headphone noise is there. You need to set level on the bass, keyboards, the strings, and guitars need a chorus and a slapback verb sometimes. There are so many things I have done to make an OK track sound a lot better and a good song sound great. This DVD will cover many of the questions you have and need to know. Just doing vocals in the mix could take all day and I love that part the best, I like to put everything in subgroups to control and set effects in the groups which we call Aux sends. All the techniques we teach it seems no one want to show you, I guess their afraid you might do it better then them but this is just music and it should be fun so we're going to show it all. 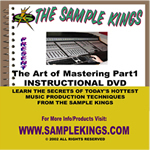 Watch this DVD and learn more about the mix.